Kumkumadi Tailam (Kumkumadi Oil) improves glow and complexion of the skin. It can be used as a moisturizer. It is most suitable for almost all types of skin, especially more beneficial for dry skin. It increases luster and prevents black spots, dark circles, scars, and hyperpigmentation. Usually, it is an effective ayurvedic remedy used for treating hyperpigmentation. It contains natural ingredients, which are safer for the skin than chemical based creams. It can also be used regularly without any issue or side effects. Take coarse powder of all above herbs and soak in 9.126 liters water for a few hours. Then boil the water with herbs and simmer the mixture until only 1/4th part of liquid content remains. Now, filter the decoction. Take these herbs for preparing Kalka. Add a small amount of water and make a paste. Now, mix all Kalka (herbal paste), sesame oil, and goat milk in a vessel and boil the mixture and simmer the mixture until only oil remains. Now, take Saffron (Kesar) and rose water and prepare a paste of saffron with rose water. Add this saffron paste in the oil and preserve it in a glass bottle. This is called Kumkumadi Tailam. Note: The Kumkumadi Tailam available in the market is not a mixture of oil and saffron paste. In that, saffron is added during preparing the oil. The oil prepared with the traditional method explained in this article is more beneficial and provides good results. This formulation of Kumkumadi Oil is according to bhaishajya ratnavali, Chapter 60, KSHUDHRAROGA CHIKITSA, and VERSE 115-120. There is a slight variation given in Ashtanga Hridayam (UTTARSANSTHANA, Chapter 32, KSHUDHRAROGA CHIKITSA, VERSE 27-30), but the most ingredients are same. In Ashtanga Hridayam, Kumkumadi Oil is recommended for nasal instillation, but in Bhaishajya Ratnavali, it is recommended for massage. Kumkumadi Tailam is used to prevent and treat skin diseases especially related with unusual pigmentation. It is found to be more effective for blemishes and wrinkles. Kumkumadi Tailam makes skin glowing and reduces pigmentation. This effect is likely due to its influence on the epidermal inflammatory response, which induces oxidation of arachidonic acid and increases the release of leukotrienes, prostaglandins, etc. These chemicals alter the activity of melanocytes and immune cells, which likely results in hyperpigmentation. Kumkumadi Tailam has antioxidant, anti-inflammatory, and anti-hyperpigmentation effect, which breaks the chain of these chemical processes by reducing inflammation and exerting antioxidant action. It is also likely to reduce the release of melanin pigment. It has antibacterial, antioxidant and anti-inflammatory effects, which helps to prevent and treat acne or pimples. However, it is less effective in the treatment of acne when compare to other ayurvedic formulations. Kumkumadi Tailam has a mild cleansing effect, which helps to prevent acne and pimples. Its regular massage removes dead skin cells and prevents infections in the sebaceous glands of the skin. It has anti-inflammatory action on the skin, which reduces the redness in the acne. Local application of Kumkumadi Oil with oral ayurvedic medicines according to underlying cause is helpful in the treatment of acne. Most commonly, Shankh Bhasma and Kutki (Picrorhiza Kurroa) is used to treat acne and prevent its recurrence. Some people may also require Gandhak Rasayana. Kumkumadi Tailam lightens the scar marks and improves complexion. It is commonly used to treat acne scars. The oil penetrates through the skin and reduces inflammation in the skin pores. In initial stages, it provides good results. The initial stage is immediately after the acne healing. It can also be used on acne to prevent scars. In later stages, it also effective to lighten the acne scars. In addition to its application, internally Yashtimadhu (Licorice) along with Amalaki Rasayana is good for scars. Kumkumadi Tailam prevents skin discoloration. Blemishes can occur due to several causes including hormonal imbalance, sun exposure, bad dietary habits, aging etc. 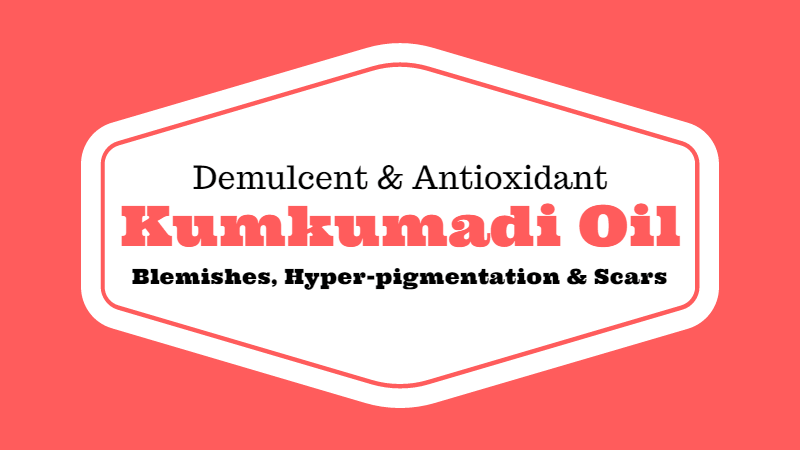 The local application of Kumkumadi oil is helpful for fading blemishes and restoring the natural color of the skin. In ayurveda, blemishes are occurring due to excess Pitta and Vata Dosha. Therefore, internal medicines like Yashtimadhu (Licorice) along with Amalaki Rasayana are useful for treating aggravated underlying Dosha. In our clinical experience, we also found good results with this combination in about 60 to 70 percent people. This combination can result in the disappearance of blemishes with 3 to 6 months in most cases. We use Kumkumadi Oil in combination with Almond Oil (Badam Rogan Shirin) mixing both in equal proportion. This combination gives instant results for increasing skin glow. This combination is found to be effective in cases of blemishes, hyperpigmentation, skin discoloration and scar marks. In most cases, the instant glowing effect can be seen. Its regular application makes skin radiant. Note: Sometimes, a little improvement is observed with Kumkumadi Oil, especially in hyperpigmentation, blemishes, and scars. In such cases, most of the people require internal remedies. In most cases, Yashtimadhu (Licorice) along with Amalaki Rasayana is useful. Amla Murabba is also helpful. Nasal administration (called Nasya in ayurveda) with Kumkumadi Oil is recommended in Ashtanga Hridayam. 2 to 4 drops of Kumkumadi tail is instilled in each nostril. People with hyperpigmentation, blemishes, black marks and wrinkles can use this oil by this way in addition to its local application for getting maximum results. It also reduces dark circles under the eyes and premature graying of hair. Kumkumadi Oil is applied on the face. Wash your hands and clean the face or the skin. Take a few drops of the Kumkumadi Thailam in the hands and apply the oil on the face or the skin of the affected parts. Do a gentle massage with fingers for at least 5 to 10 minutes. A gentle massage enhances the absorption of the Kumkumadi Tailam. Note: Washing off the skin reduces the effects of the Kumkumadi oil, so it is recommended that leave it at least 3 hours. People with oily skin should leave it for at least 1 hour and then they can wash the face. People with dry skin should not wash their face at least 3 hours. They can also use it before sleeping and leave its application overnight for more beneficial effects. In blemishes, scars, hyperpigmentation and marks, it should be applied before sleep and leave it for overnight. The external application of Kumkumadi Tailam is considerably safe. Kumkumadi Tailam is highly beneficial for people with dry skin. You should consult an ayurvedic physician before its nasal instillation. Generally, Kumkumadi Tailam has no side effects. However, it can produce some oiliness, which may not be suitable for people with oily skin. Oily Skin: People with oily skin should wash their face after one hour of its application to prevent excessive oiliness of the face or to remove the excess oil. For people with Oily skin can use Kumkumadi Lepam making a paste with rose water without adding oil in it. Hello, thank you for writing this article. I want to know if Kottakkal Kumkumadi tailam is prepared with traditional method or saffron is added during the oil preparation. If not prepared traditionally then what brand would you recommend? Also would mixing this oil with Nalpamaradi oil help in getting better complexion and reduce hyper pigmentation, if not what else would you recommend? I am not sure how any manufacturer prepares the medicine and which classical text they follow. You should contact the manufacturing company for more details. In my opinion, Kumkumadi tailam by Arya Vaidya Sala, Kottakkal provides good results. Yes, Kumkumadi tailam can be mixed with Nalpamaradi oil. We got good results when we used it along with Almond Oil. Does this help to remove surgical scar? Kumkumadi Oil is less likely to remove surgical scar. However, its regular application may improve scar appearance. If you start applying it along with Jatyadi Oil during healing of surgical wound, it may help prevent the formation of a deep scar. Does Kumkumadi Oil reduce or remove tiny white spots on the skin due to vitiligo? Can I take triphala? Does triphala or amla help in my case? Kumkumadi Oil is not indicated in vitiligo. Instead, Bakuchi (Babchi) oil is useful in this case. Triphala can act as supportive medicine. The drug of choice for vitiligo is Bakuchi. Do you suggest that we make Kumkumadi tailam on our own.. Where would we get all the ingredients mentioned. Or should we buy… Do you suggest any brands. You can buy all ingredients from an herbal store. There are several brands available. Here is a list for the most popular.